Christmas Mantel 2012 … Chalkboard LOVE! This year, I wanted to do something a little more, well…me when decorating my mantel for Christmas. I wanted a gigantic chalkboard in the middle, urns with evergreen trees, and real garland this year. I have a chalkboard obsession, and any of you who have been around for a while know it isn’t going away any time soon. I’ll try not to bore you with the details, but if you feel like you need a chalkboard fix, you are welcome to check out my Turn a Mirror into a Chalkboard post or my post on Turning an Old Picture Frame into a Chalkboard, there is even a post on How To Make Chalkboard Vinyl Labels…I know, it’s a sickness. She was selling this huge mirror from an old dresser for $20, and I had to have it. I knew it was meant to be…this mirror would some how, some way become the chalkboard of my dreams. Sadly, it took me 3 months to finally start…then I became obsessed. 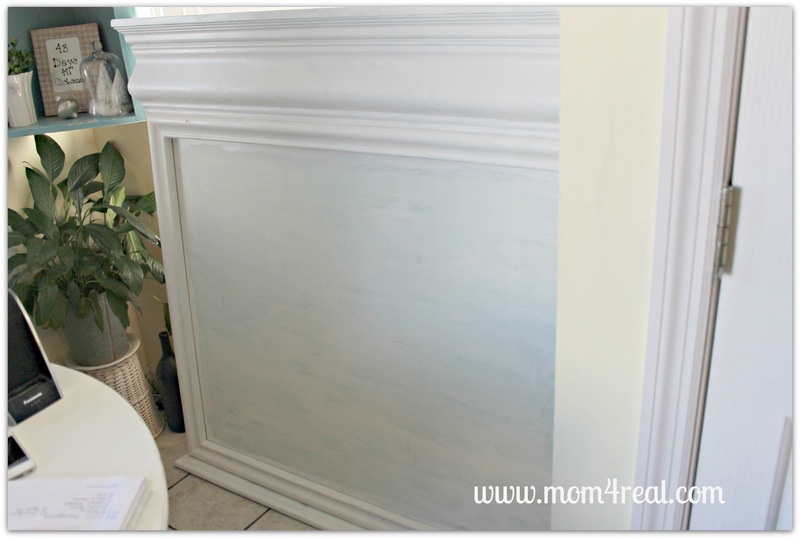 I used some white chalk paint, and covered the entire thing…wood and mirror both. I went ahead and painted the wood with an extra coat, then distressed with a sanding block. 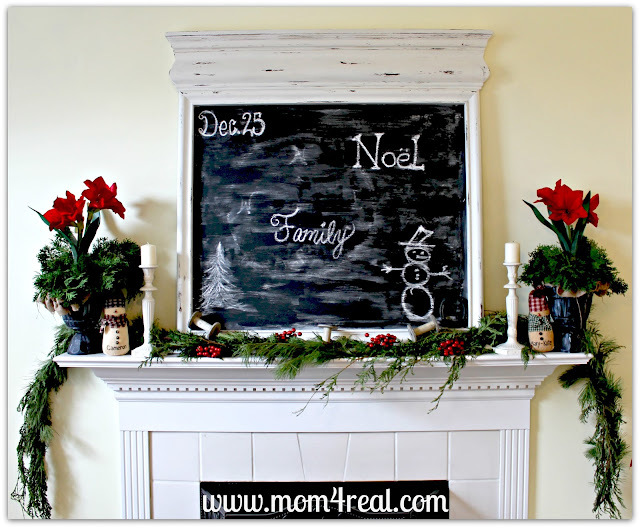 He helped me lift the gigantor chalkboard onto the mantel, then the decorating began. I added fresh garland, the Urns I made for less than $3 each were stuffed with arborvitae clippings from our yard and some old amaryllis, then a few more small details were added. So, how about you? What do you think? Have you done any Christmas decorating yet, or am I just Christmas crazy? 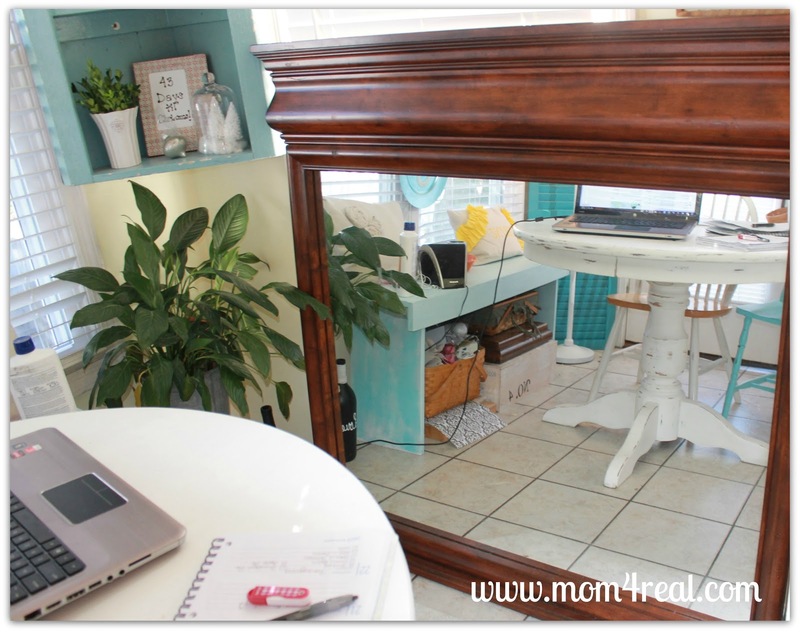 What a great idea to use that old dresser mirror!!! Love it! LOVE! LOVE! LOVE! What a great find and an awesome transformation! I love your mantle! GORGEOUS, Jessica! This looks SO great! It’s hard to believe that it used to be a mirror – great score and decorating!!! Awesome! I love how that turned out! Love the crown molding on the top of the mirror! That is such a great piece. And that garland is fabulous too! Very cute mantel. Love the distressed look of the chalk board. It is meant to be on your mantel!! It looks amazing!! You know what? I think the little spools may be my favorite part! But then again, anything looks amazing against a chalkboard. :) I’ve got chalkboard on the brain, like, always too. What can you do? Run with it! Jessica, I will never look at mirrors the same! I had no idea you could turn a mirror into a chalkboard! Yours looks marvelous as part of your Christmas mantel display. Love how you added those spools into it, too. I forgot to thank you for adding our blog to your sidebar! Thanks so much and I’ve added you to ours, too! Absolutely Love it Jess! Love, love, love it! I want one now! (adn I can’t believe you scored that awesome mirror for only $20) Awesome job! I love that huge chalkboard on the mantel. Great transformation. 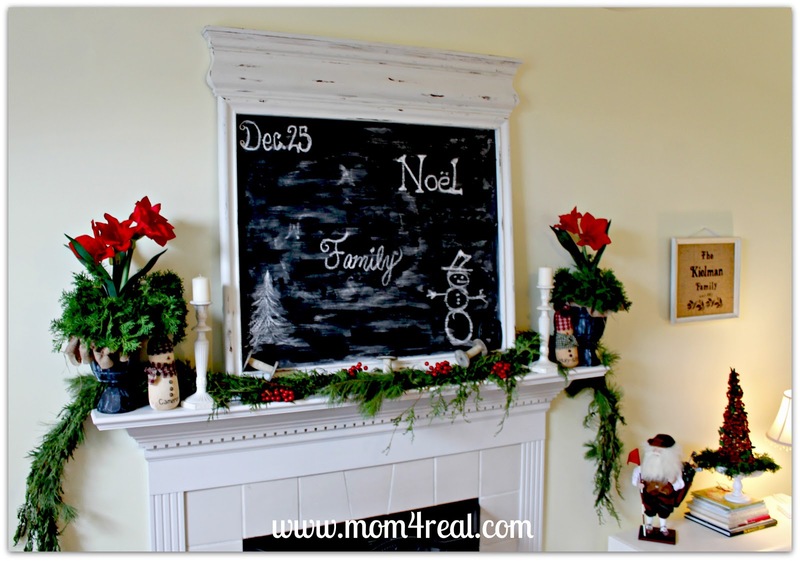 I love the chalkboard idea! 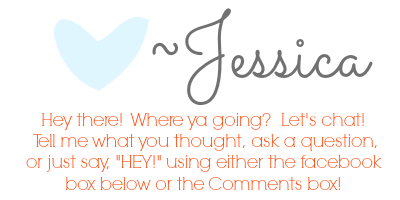 I saw your blog on the Meet me Monday Link party and wanted to check it out! Absolutely fantastic!! I love what you did. BTW, my friend just bought that house that is pictured in Cottage Living! She didn’t get to keep the chalkboard, though. It’s a great inspirational house!! It’s freaking super gorgeous girl. $20??? You scored. It’s fabulous and it looks great right where you put it! Happy Holidays to YOU! You wonder decorating diva. You had me at gigantor chalkboard! It looks amazing and I love that you used your urns :) and for $20~get outta here! Nice job on the chalkboard, that turned out gorgeous!! I loved your mantle too, all together it looks beautiful! Girl you outdid yourself on this one! WOWZA..it was totally meant to be. I love it. What a steal too. Wow, this is so SO stunning! I can’t believe it’s even the same mirror! You’re crazy good – I share your obsession with chalkboards! What a beauty and the whole mantel looks amazing. Love the chalkboard! It looks better than your magazine inspiration! Actually, I love your whole mantel! 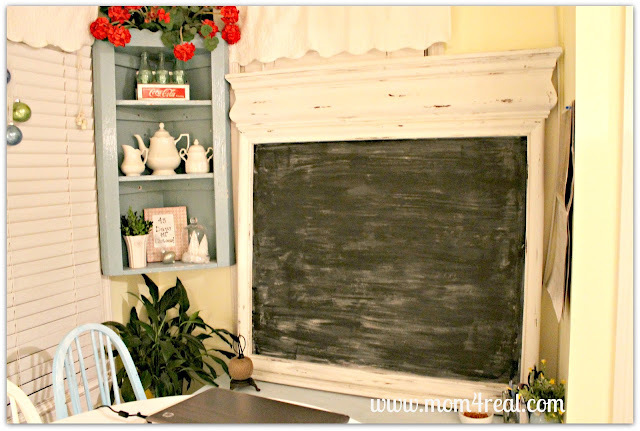 Stopping by from The Life of Jennifer Dawn and let me tell you I LOVE the chalkboard! I too looked for quite sometime for an old school house chalkboard. I never did find one and I settled on buying a newer magnetic chalkboard, but yours is stunning and it has re instilled in me the desire to search on! What a clever idea! It’s beautiful! I love it! You did a great job…it’s beautiful! This turned out beautifully! I love the very dark as the center of the mantle display. 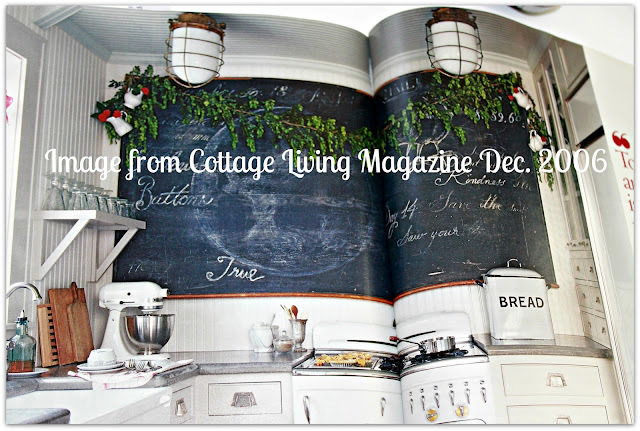 I so miss Cottage Living magazine . . . I still have about 6 years worth packed away. 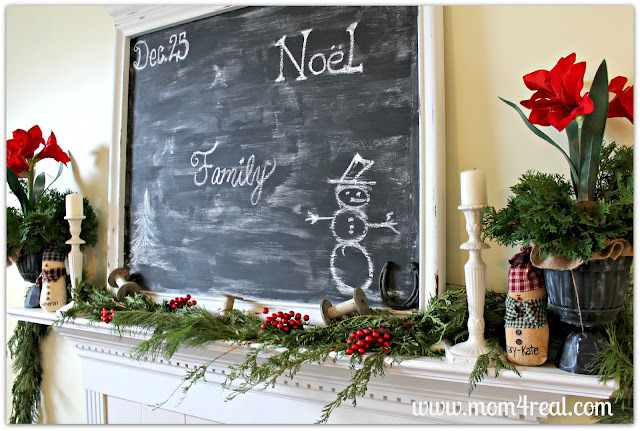 The mantel is so very cute and festive….great idea about the chalkboard…you did a wonderful job as always!! Looks great!! You did a great job! Your chalkboard is awesome!! It makes a great centerpiece on your mantel. Your mantel is beautiful! And you did a great job with the mirror transformation into a chalkboard! Aw, it was meant to be Jessica. I love that you had such vision when you saw this mirror. It looks perfect now as the chalkboard of your dreams! Great job. So Pretty~~ I think that is the chalkboard of my dreams too!! Wow, what a transformation. I love it. I have a stack of Cottage Livings that I refer to all the time… and it still looks so fresh! Love your project. This is just gorgeous!!!!! Featuring later today! Awesome price on that mirror:) It’s perfect for your mantel too! Makes a huge statement and that’s what we all want, right? Looks great! So pretty.. And I love the chalkboard! It turned out great. Wow, I didn’t know that you could paint a mirror with chalkboard paint! Really?? That is so cool! It looks fantastic. I have learned so much just from reading blogs! Would love if you stopped by the Holiday Linky Party – mantels – to link it up! The party is happening NOW! Looks fab Jessica! I tried turning a mirror into a chalkboard once – epic fail…the paint kept bubbling in a few places! I like the idea of painting it with chalk paint first! Beautiful decorating – so festive! You really blew me away on this one Jessica. Awesome job! So happy you joined me. It is amazing and gorgeous! A dresser mirror…I would never have thought to use that. Great job! What a great idea! It looks fabulous on your mantel! Very cute Jessica – and I adore that chalk board!